It may have been mentioned on another thread, but I haven't seen. 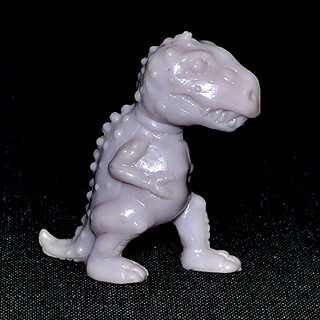 Predasaurs:DNA Fusion are under 2 inches, rubber, and have little weapons that attach to their hands. I bought a blind pack at Target, it is pretty cool as far as dinosaurs go. I like Predasaurs, and the Euro line Dinofroz a lot. Dinofroz:Combact is insane. I tend to favor mono or near mono figures, so I am a fan of the Panosh Dinos (although I think the Mites look nicer than the Brites, even if they are somewhat painted). I have a soft spot for those cheapo Hong Kong dinosaurs that have come out over the years in vending machines and dollar stores and the like, which look like weird combinations of dinos and random monsters. The more bizarre-looking the better. I also like the MIMP dinos, but not the U.K. regular ones, the mono, more rubbery ones that were released in Hardees kids meals. Those are cool. I like series 6 MIMP and the Hardess version.